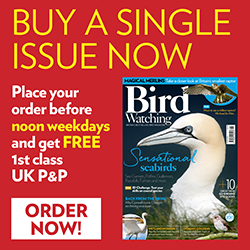 May is the time of maximum diversity of birds in the UK. Many of our ‘winter’ birds are just about still here, while just about all the ‘summer’ visitors are in. Then again, there are many birds moving through on their way to their northern breeding grounds out of the UK altogether. Add in some fine weather and long hours of daylight and you couldn’t ask for more. There are many, many great birds to look for this month, but here are four of our suggestions. Go get ‘em. Large and just about unmistakable, the White Stork is one species which could be soaring overhead on a warm May day. Note the contrasting pattern, extended white neck and long red bill. A certain amount of caution is always appropriate with White Storks, as several free-flying birds have escaped from captivity. Check carefully for rings on the legs. This bird is perhaps most familiar from the Icelandic subspecies which gathers in significant numbers in the UK in early spring on the way to the breeding grounds. This subsecies is darker, more intensely coloured and slightly shorter legged than the nominate European birds. The latter breed in very small numbers in the UK, and at selected sites (notably the RSPB Nene Washes, Cambridgeshire) they can be seen and heard doing their rocking display flight, while whining ‘godwit, godwit, godwit’. The lovely Turtle Dove is a once-familiar bird on the fast track to no longer being a British breeding bird at all, such is the rate of its recent decline. This is a huge pity, as it is a very attractive bird, soft and gentle looking, with a purring song which is the epitome of warm summer sounds. Turtle Doves are smaller than Collared Doves, with scalloped orange-and-black backs, blue grey heads and pink breasts. Once a very scarce breeder, the Hobby is a recent success story in the UK. Hobbies are long winged and slim, built for speed and agility so they can catch their prey of insects and perhaps hirundines while on the wing. In May, flying insects are the main prey, such as the abundant St Mark’s Flies out now. Later in the summer, dragonflies will become the main prey.